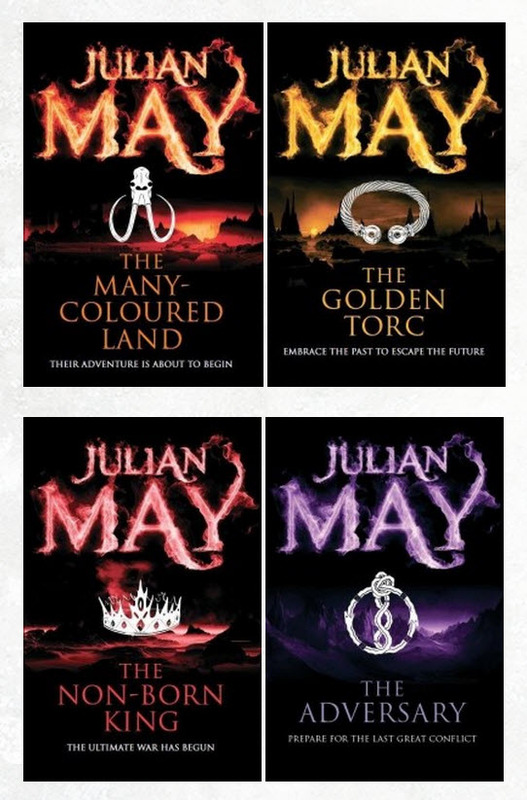 Julian May is a name that may be unfamiliar to most contemporary readers of Sci-Fi or Fantasy literature however she (Julian being the nom de plume of Julia) is the author of several books that have been hailed by critics and fellow writers alike as the equal of the works of such genre doyens as J.R.R. Tolkien or Frank Herbert. The novels making up the four-part ‘Saga of Pliocene Exile’ (or the ‘Saga of the Exiles’) and the later three-book ‘Galactic Milieu Series’ are without doubt some of the most complex yet engaging stories to have been published in modern Sci-Fi. 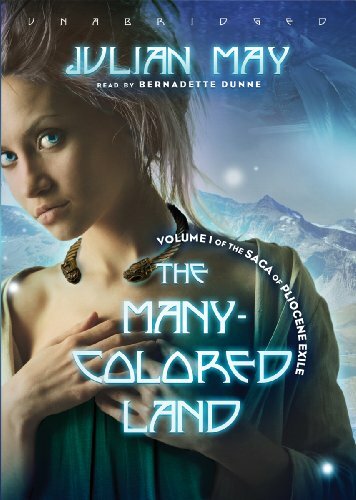 Beginning in 1981 with the appearance of ‘The Many-Coloured Land’, the first of the ‘Exile’ series, they are an epic work of remarkable ability, all the more so since they came from a writer who was then in her late 40s and whose only previous known SF work had been the novella ‘Dune Roller’, published two decades earlier. Taking some of the most familiar tropes of Science-Fiction (extraterrestrial encounters, galactic civilizations, time travel and ‘psychic’ powers) May produced a series that stands head and shoulders above most other efforts in the SF or Fantasy fields (indeed the term ‘Science-Fantasy’ probably best sums up the feeling of the earlier ‘Exile’ books despite their quasi-scientific basis). However unlike much genre literature none of the human story is lost and the characters are anything but stereotypical of SF, especially of the 1980s’ variety. Instead they are fully rounded men and women (and others): complex beings driven by the sort of passions and emotions we are all familiar with and that are the essential ingredients of life – and drama. The story of the ‘Saga’ itself is complex beginning in a near future period of our own world and then plunging back into a far, far distant past as we follow the adventures and misadventures of a diverse group of time-stranded men and women across primeval Europe and beyond. Indeed it is from the past and specifically our own Celtic past here in Ireland that Julian May drew her chief inspiration. The world created for us is one populated by peoples and cultures that for anyone of Irish, Scottish or Welsh descent is eerily familiar while being ostensibly alien. And if you’re worried that this is yet another awful rehashing of Irish and Celtic Mythology under Fantasy or Science-Fiction dress, don’t be. The Saga is much more than that, much greater, much grander and at times altogether more moving. It is one of those very rare stories in literature where, when the main characters have issued their final words and the author has finished the closing sentence, we are left with a profound sense of loss as if we have left an old friend behind. The only other work to have touched me so was the ending of Tolkien’s ‘The Lord of the Rings’ and the only work in my opinion to come close to rivalling May’s. Some years later, to the gratitude of readers like me, Julian May returned to the universe she had created but wisely not to the original story. Instead she took us forward (and backward) to a tale that explained how the world shown in the books of the ‘Saga’ came to be. It is, I suppose, a prequel but that with its dire overtones of other prequels to SF and Fantasy works by lesser writers eager to cash in on the popularity of their books implies something grubby and exploitative, a reselling of old ideas in a new form. The books of the ‘Milieu Series’ are most certainly not that. They are entirely new, entirely Science-Fiction and an epic in their own right but one much more personal, much more focused, much more (ironically) human. They are like a literary Celtic knot that ties the two series of her imagination together so that there is no beginning, no end, but an incredible seamless whole. If from all the above, you take it that I am a passionate fan of the Pliocene and Milieu books then you are entirely correct. When I first started reading them in my mid teens they were a true awakening. Just as I was beginning to experience adult emotions and adult thinking here came a series of novels littered with adults (not, as with so much of SF and Fantasy, children in the guise of adults). I grew up as they grew up. At the same time I found in Julian May’s stories a host of echoes, ghosts from my own childhood and culture, the myths and legends that my mother raised me with, that I learned in school and began a life-long love affair with. I fully admit that for anyone of Irish descent these books will have a particular satisfaction, they will spark feelings and emotions, a sort of race memory, deep inside. But many others far and away from these Celtic Isles have similarly been touched by the magic of these stories – magic that lies in the imagination of their author and the undoubted skill of her words. Julian May left the world (or worlds) of the ‘Exiles’ and ‘Milieu Series’ books behind long ago and has published many other novels since. However none have come close to equalling that which came before being somewhat mundane middle-of-the-road SF efforts. However that doesn’t matter. With her two earlier series she has established herself as one of the truly great writers of the Sci-Fi genre. The four-book original series, the ‘Saga of Pliocene Exile’ in the USA (or the ‘Saga of the Exiles’ elsewhere), is now out of print and is hard to come by. If you do find any copies I cannot recommend it highly enough to you. The later trilogy, the ‘Galactic Milieu Series’, though very different is just as good but unfortunately is also out of print. However if you do find it I again recommend it as a worthy purchase for your hard earned cash (don’t worry about the dates and years in the books themselves, just enjoy).There is a book that brilliantly links the two series, the ‘Intervention’ (in the USA it was published inexplicably as two volumes, ‘Surveillance’ and ‘Metaconcert’) that should be read before entering upon the latter set of novels (and yes, I love Uncle Rogi too). Finally there is the standalone and very hard to find ‘A Pliocene Companion’ which contains a wealth of information about the ‘Saga’ and an interview with Julian May, and is well worth hunting down if you (like me) long to know what happened after Aiken Drum left us on the final page. UPDATE 29/01/2013: Good news! Tor Books are reissuing the entire series of novels in the Saga of the (Pliocene) Exiles and the Milieu sequence. More information here and an interview with Julia (Julian) May here from 1982. Though dated by some of the events of recent history I still say: buy these books! Love the stories, read them in 1983 and in 2013 found copies on Amazon. Introduced my son to the series. We cant put the books down! Unfortunately I don’t know Celtic and you didnt translate the rest of this form. So I geussed. They are wonderful stories and its great to see them back in print. They may have been dated by the passing of time (no more Soviet Union!) but they still have much to commend them. I’ve read them several times and will do so again. Julia(-n) May certainly deserves more fame than she has gathered. Agree with your analysis of the books – I revisited them recently after a long break and was riveted all over again. I had the Pan originals of the last two in the series but was really disappointed by the quality of the Tor reprints. Full of errors and it looked like someone had printed out a draft copy because there were still circles around some of the spelling mistakes! Amazing series, and so hard to find fan stuff related to them. Very true. They are sort of forgotten or at least it seems so online. There was another site dedicated to the books which was interesting, in maverick sort of way. Ah, here it is! Thanks for the links, Nicky. Some interesting ideas. I’d love to see a return to the Milieu or Pliocene stories. Unfortunately that is never going to happen so fanfiction might be the next best thing. Oh, I see that, unfortunately, Julian May passed last October aged 86. RIP. Yes. I meant to publish something about it, got a few words down, then put it to one side. Too close to me. Others did it better anyway. I should return to it though. Her books meant a lot to me at a tough time in my teenage life. Thank you for this posting and the links. I read all of these in the 80s and 90s. Got the whole set on kindle again over the summer. Excelkent series, definitely among my favorites and wish they were better known. Hadn’t realized Julian May had passed. Would have loved to have seen more stories in this universe. Me too. She was a great writer, though the Pliocene and Milieu books were undoubtedly her best (I gave up on the Rampart Worlds’ series half-way through the first book though I’m told that the Boreal Moon trilogy is better).